Mimi Wilson was always planning events for friends and family members, so a few years ago, she decided to start doing it professionally. After planning numerous weddings, she realized that a lot of couples wanted to get married in a space that was somewhere between a big church wedding and a no-frills civil ceremony. 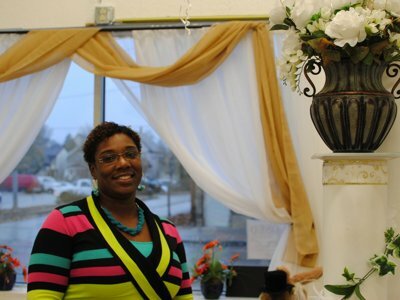 Recently, Wilson opened “She Said Yes,” 1412 S. 72nd St., in West Allis. The space is available for weddings, showers and anniversary parties. “It’s a step up from the courthouse and a step down from the church house,” she says. The basic wedding package is $600, which includes rental of the facility – which seats about 50 people – along with an officiant, a unity candle and a rehearsal. Wilson’s fiance, Hughey McClinton, is an ordained minister and wedding officiant who will perform just about any ceremony. Couples can provide their own words or pick one of McClinton’s ceremonies. Couples can also bring in their own officiant if they prefer. Parking is available next to the building and there’s space in the lower level for the wedding party to change. Wilson also works with local photographers and restaurants and can arrange receptions for an extra charge. The space is the ideal size for a small- or medium-sized wedding. The best features are the large windows, both in the front of the “chapel” and along the wall, which let in a lot of natural light. The decor is simple: white walls, mirrors, white flowers and draping white curtains. It’s not fancy, rather more of a blank slate space which people can tailor to their personal tastes. Wilson says Friday and Saturdays are usually the busiest times for weddings but, surprisingly, did not notice June to be busier than other months even though it is traditionally known as a popular month for nuptials. There is also a wedding chapel on Greenfield Avenue called Parkside Wedding Chapel, which OnMilwaukee.com recently reported on, as well. The quirkiest and arguably the most notable wedding chapel, however, is in Portland, Ore., and called Voodoo Donuts, an “alternative pastry” shop that also provides wedding services (complete with a coffee-and-donut reception, of course). Karen Fong got married in a chapel-like space in Illinois last year. It seems such spaces are increasing in popularity for couples who want a non-denominational service at an affordable event that still feels like a traditional wedding. “We wanted something nice, but not expensive. We thought about holding our wedding outdoors, but decided we didn’t want to stress about the weather, so we went this route instead,” says Fong. Wilson, who grew up in Milwaukee, says she and her sister came up with the name “She Said Yes” in a brainstorming session.